This spiritual story is narrated by a rich young woman who is dying and who describes her journey into the Afterlife, where at first she believes she is in heaven, but then learns that she is travelling into Outer Darkness on a quest which may never be accomplished. Throughout her life Margaret Oliphant believed that women must help each other; and that each able woman should take responsibility for another woman who was struggling. She voices this philosophy in this short novel. This little book is missing the usual subtitle, "A Story of the Seen and Unseen". And Margaret Oliphant was mistaken in thinking that the story would be recognized as her work. Perhaps a new generation of reviewers were less familiar with her Little Pilgrim and other spiritual stories. The book came out in a small edition, followed later by a "second edition" with a paper cover. * Passage from the Autobiography and Letters (page 419). 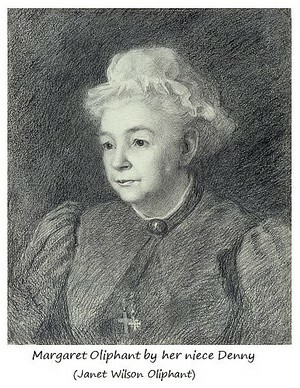 Margaret Oliphant's cousin Mrs Coghill (Annie Louisa Walker), the editor of the Autobiography and Letters, was unaware of the existence of Dies Irae. She believed the letter to Mr Blackwood must be referring to a forthcoming article in Blackwood's Magazine, "Fancies of a Believer". But it would not have been necessary to request anonymity for "Fancies of a Believer", since virtually all articles in Blackwood's were published unsigned in any case.